Parodia is a genus of cactus native to the uplands of Argentina, Peru, Bolivia, Brazil, Colombia and Uruguay. There are about 50 species, many of which have been transferred from Eriocactus, Notocactus and Wigginsia. 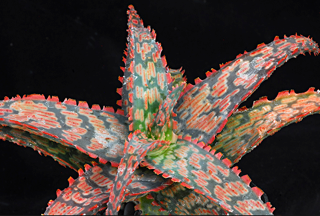 Aloe, is a genus containing about four hundred species of flowering succulent plants. The most common and well known of these is Aloe vera, or "true aloe".